The word flax typically conjures of thoughts of fine linen or a special vegetable oil found in natural food stores. Linen and flax seeds come from the plant Linum usitatissimum, the species known as common flax, but there a number of other types of flax grown for their delicate flowers. Linum species come as either annuals or perennials, generally having an upright growth habit and varying in between six inches and three feet in height depending on the species. Some are useful in annual beds and perennial borders, while others make good rock garden plants or can be used as part of wildflower meadows. New Zealand flax is an unrelated species that resembles agave. Most flax plants bear light blue flowers, but there are yellow, red, and white varieties as well. Perennial flaxes tolerate extreme heat and cold and need minimal water once established. Sow seed directly where they are to be grown in fall or, if using transplants, put them in the ground in spring. The primary care needed is to prevent weeds from encroaching around the young plants. 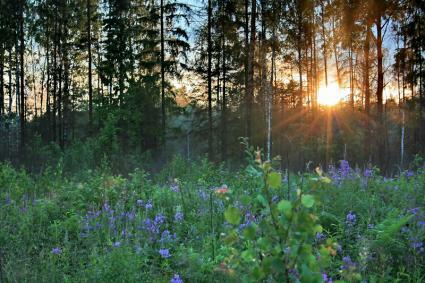 Flowers appear in early summer, but they will bloom again if the dead flower heads are removed. Perennial flaxes can be cut back halfway to the ground in late fall to produce compact growth in the following season. Lewis' flax (Linum lewissii) and blue flax (Linum perenne) are the most common perennial species, both of which bear the classic blue flax flowers and grow as clumps two to three feet tall and 12 to 18 inches wide. In nature they are found in relatively dry, open environments like the prairies of the Midwest and the scrublands of the mountainous West. They are a great addition to a sunny flower border or cottage garden, though they are short-lived. The basic species will seed themselves in the right environment, however, and are often included in wildflower seed mixes for this reason. 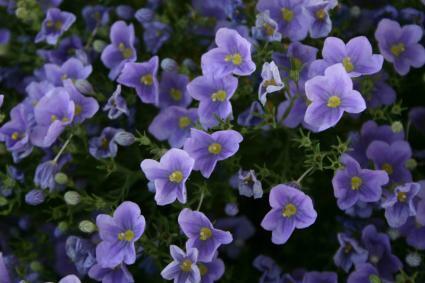 Alba is a cultivar of blue flax that bears white flowers. Golden flax, a yellow-flowered species, is another type of perennial flax that grows wild at high elevations in Europe. Topping out at just 12 inches in height, it is well-suited to the colder parts of the U.S. where it is a popular rock garden plant. Gemmell's Hybrid is a cultivar of golden flax that grows only six inches tall and has larger blossoms than other species and a more vivid yellow color. 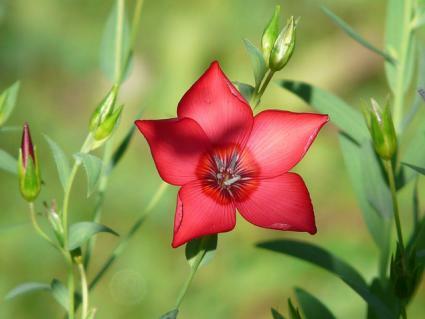 Scarlet flax is the primary annual species grown. The basic species has crimson flowers on 16 to 20 inch stalks, though the plant has been bred for a number of other colors. They are typically found as a mix, called Bright Eyes or Charmer Mix, which includes red, white, salmon and lilac petals with an eye in the center of a contrasting color. Scarlet flax can be grown in any climatic zone in North America and is useful at the back of annual flower beds or massed in drifts to fill in bare spaces in a perennial border. Scarlet flax does not transplant well, so sow it directly in the bed where it is to grow in early spring. Cut the plants back in summer for a second bloom or sow repeatedly for multiple blooms. Average garden soil is fine, though the seedbed should be loose to encourage vigorous seedling growth. Water on a weekly basis if there has not been a soaking rain. Flaxes are generally trouble free plants as long as they are grown in an appropriate environment. The alpine golden flax, for example, does not do well in hot humid places and needs excellent drainage. In general, it's best to err on the side of under-watering flax, rather than over-watering - they are fundamentally a drought-tolerant species. Rather than pests and disease, the main problem with flax is that they grow a little too well. 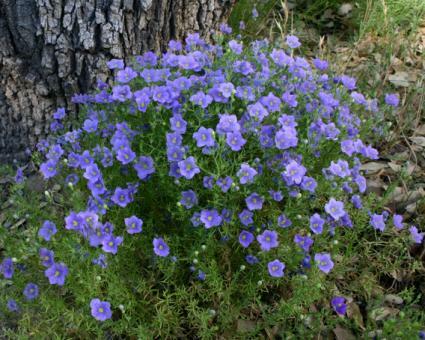 They sometimes seed themselves profusely, especially blue flax, and end up growing in the lawn or other places where they are not desired. However, they are easily removed by hand. The flaxes are surprisingly unknown among gardeners, but their simple good looks and ease of growing certainly merit more attention. If they are not available in your local nursery, they can always be found in mail order seed catalogs.